I've got the table mostly set. I pulled out all of the nice things that have been given or handed down to me, which normally stay tucked away in a cupboard. I still need to iron the napkins. I've made a variety of little gifts for all of my family members. Here's how I wrapped up the egg-shaped soaps. I cut a single slot/hole from a cardboard egg tray, stuffed it with some shredded paper, placed the egg-shaped soap inside, then wrapped with clear cellophane and tied with lavender ribbon. All of the wrapping materials were scavenged from what I have: the egg tray from a 5-dozen egg box, the shredded paper from a Christmas package, the cellophane cut from a gift bag received at Christmas, and the ribbon came on packaging many years ago. I made the chocolate bunnies and bird's nests. This year, I made both white and brown bunnies, as I purchased both white and chocolate dipping candy on clearance right after Christmas. However, I went with all chocolate nests as I was making a whole batch at one time. To wrap the bunnies, I had more of the Easter cellophane bags that I used last year. 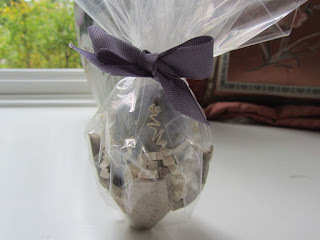 But to wrap the egg nests, I cut up a cellophane wrap that came on a bunch of flowers. After cutting open the cone-shaped cellophane, I wiped it off with dish soap and then rinsed in water. I allowed it to dry, then cut into squares for wrapping the nests. The supplies for 3-oz chocolate bunnies cost me about 35 cents each, and the 1-oz chocolate and coconut nests about 15 cents each. The molds were purchased about 15 to 20 years ago, for about $16 total. These are tin-lined copper molds that I also use as spring decor in the kitchen on the hutch where we keep our dishes. But if I factor in the cost of the molds, after 15 to 20 years of annual use, each year's cost is $1 or less. 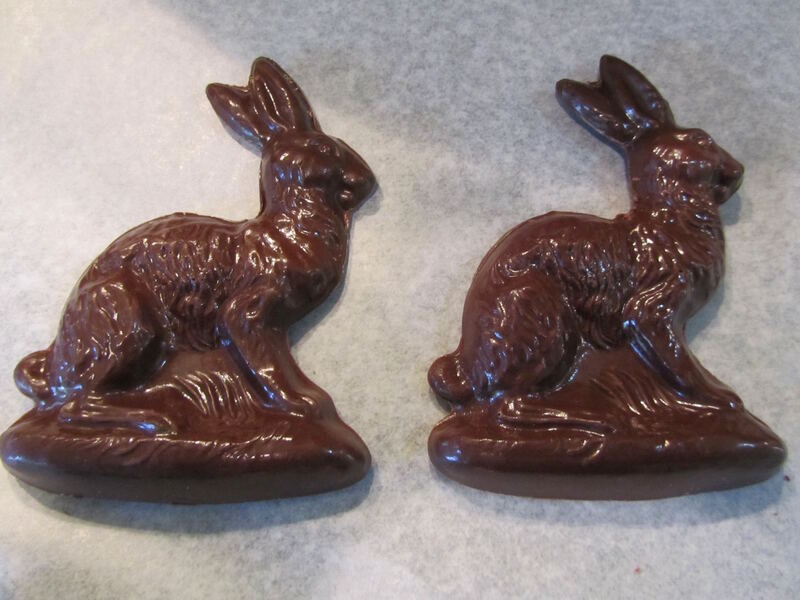 Making a minimum of 4 bunnies per year, each bunny has a mold-cost of at most 25 cents. So, even adding 25 cents to the 35 cents for chocolate, my candy bunnies cost 60 cents each, still quite a bit less than any dollar store bunny. My cost for mold-use will continue to decline with each year of use. I imagine that I will be using these same molds for special Easter treats for grandchildren, or they could be resold at a garage sale for $5 to $7 dollars each, and recoup most of my original cost. 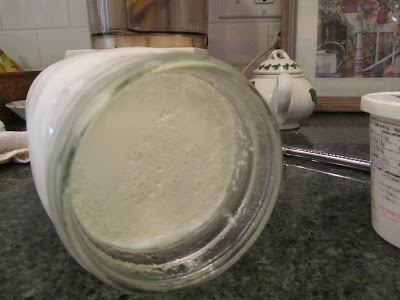 The nest are simple to make and don't require special molds. They are made with 1 ounce of chocolate and a heaping tablespoon of coconut per nest. I melt the chocolate in the microwave, then stir in the coconut. 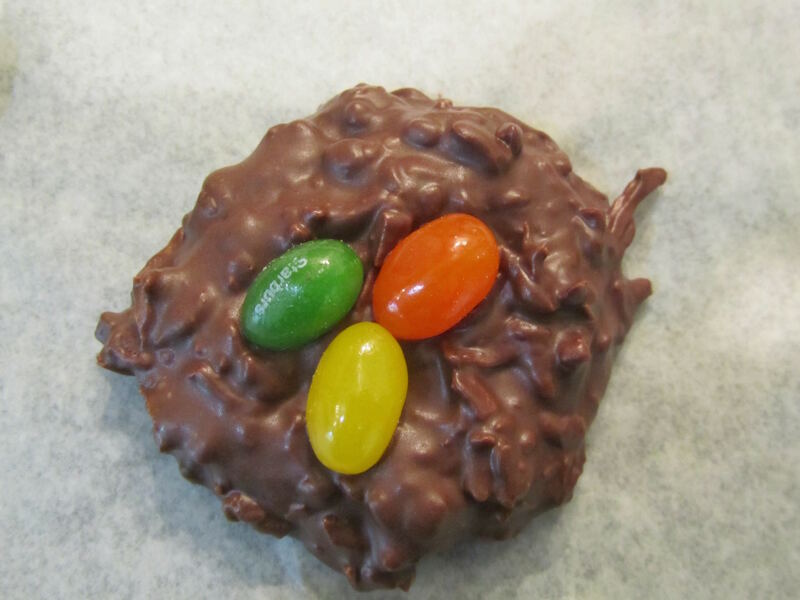 Next, I make a bunch of nest-shaped mounds and add the jelly bean eggs. 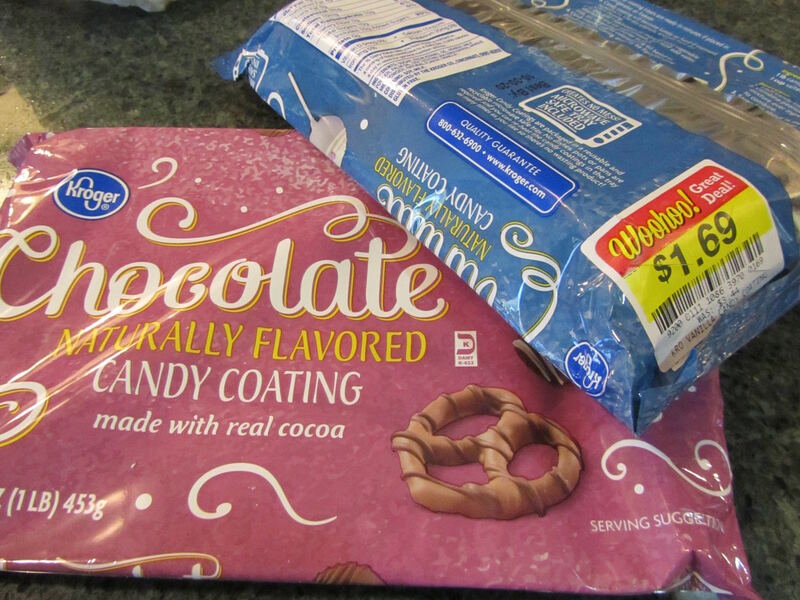 Super simple and at least half the price of similar candy nests sold in stores. Lacking the dipping chocolate, chocolate chips with a bit of Crisco shortening can be substituted. 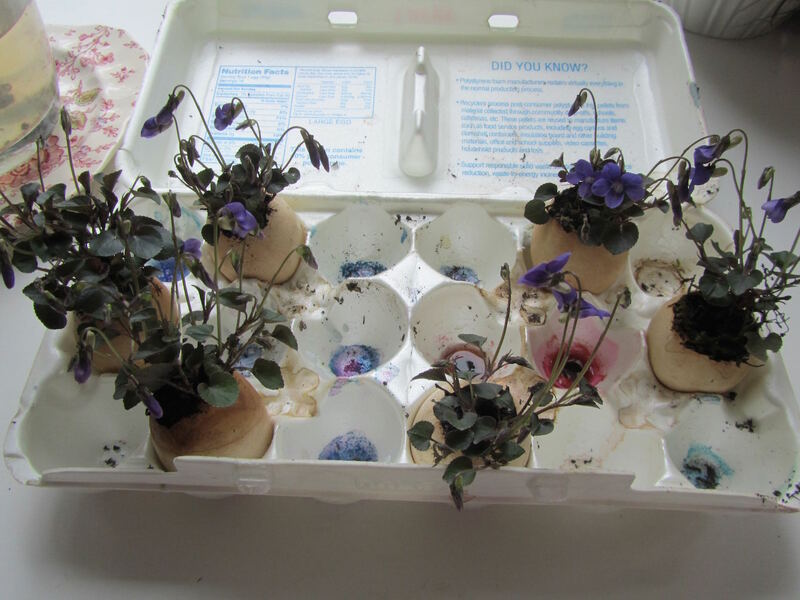 I planted all of the tea-stained hollow eggs with violets from the front yard. As I had thought, the violets on the north side of the house were about 10 days behind the violets in the backyard. The blossoms are just beginning to open. They are now sitting in a window until Easter morning, when I'll place each at a spot of the table for individual floral decorations, using napkin rings as stands. This morning, I'll be heading out to buy our ham. Several stores have great deals on ham this week. Tomorrow, I'll make the pie pastry. I make a 5-crust batch of pastry, then freeze in individual patties. Having the pie pastry ready to roll out simplifies pie-baking for me. And . . . today is my birthday. 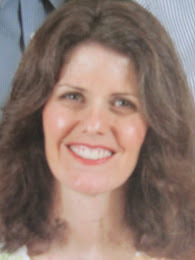 What does a frugal woman do for fun on her birthday? My daughters both took today off from work and their activities, and the 3 of us are going thrift-shopping/treasure-hunting. I'll be back tomorrow! I wish you a happy and fun-filled birthday! Your table looks lovely. I don't have a separate dining room so setting up an Easter table before Sunday isn't realistic--glad I can enjoy yours vicariously! Thank you, Kris. We had a lot of fun. I'll write more about that later. I hope that your own Easter preparations are going smoothly. Will you be hosting family at your house for Easter dinner or lunch? Hi again. It will be my own family plus my mom for a ham dinner after church. I might even dig out the china. Glad you liked the idea of meringues. I had another thought .... I've never made it myself, but I've had fudge made from mashed potatoes and it was good. Maybe some of the other readers have tried making it? I've always wondered about potato candy and thought I'd make some to try some year. This may be ,my year to try it out. Thank you for reminding me. About the meringues -- I am now planning to make a few extras to include in a package that I'm sending to my step-mom. I got to thinking, meringues are so lightweight, they make an ideal treat to mail, long-distance. So, double thanks for the idea! Your Easter dinner with family and your mom sounds lovely. Your mom must be so grateful to have you so near. The time that you spend including her in your family life may mean more to her than you realize. I'm glad for both you and your mom to have this time together. Happy birthday, Lili! Hope you have a fun day! Thank you, Kathryn. We had a great time! Happy Birthday...enjoy your fun filled day with your girls! Love all the really neat things you do to make your home so special.Your family must feel very loved by all your efforts to pamper each of them...I sure would! Thank you, Linda. You're so sweet. Happy Birthday! It's my birthday today too...how funny. Best wishes for a great day, Tina! You are so organized - very impressive! Happy birthday Lili!! Those chocolate coconut nests are just genius--so realistic looking! My inspiration for the birds' nests is simply a product already on the market. 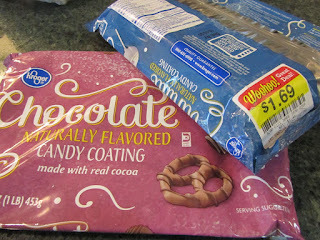 Russell Stovers makes a chocolate and coconut nest candy. I just copied. Although, I don't think theirs have jelly bean eggs. They are delicious, though. Copy or not, yours look wonderful! Hats off to you! Happy Birthday, Lili! Hope you had a wonderful day with your daughters! Thank you, Alice. It was a really wonderful day. 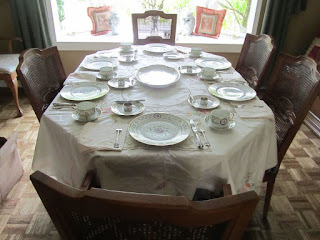 A lovely tablescape! Have a wonderful birthday, as well as Easter with your family! Wishing you a lovely Easter with your family, as well! Looking forward to seeing what treasures you and your daughters found on your outing. Happy Birthday! Thank you, live and learn! The day was fun and I'll post about it later today. Very pretty! Wishing you a very happy birthday and a blessed Easter! Wishing you a lovely Easter, as well! Happy Birthday, Lil! Your Easter preparations are lovely! I hope you Easter preparations are going well! Happy Birthday, Lili and Tina!! Everything is so nice and special. Your family is fortunate to have you. Through your effort they know not to fall for the trappings of our consumer culture. Thank you, YHF. You know, I love it when they tell me that they don't think something is worth the price. I just had this conversation today with one daughter. Makes a momma proud. Happy Birthday, Lili, and a Blessed Easter. Thank you, Shirley. Easter blessings to you, as well! Happy belated birthday. It sounds like you had a great day. The dress is very pretty and the price was amazing. Thank you, Marybeth. Yes, there were some great deals there. I've heard that some folks go there to buy things to sell on ebay. I'm mulling that idea over in my mind right now. Have a great evening.